Horse Pyxis. Greek, Attic. Geometric, ca. 760-730 BC. Ceramic. Carlos Collection of Ancient Art. Gift of Chris Carlos. Former Andrew W. Mellon Assistant Conservator Kathryn Etre treated this pyxis (lidded pot) from the Geometric Age in Greece for installation in the Greek and Roman galleries. Among other condition issues, salts from the burial environment were causing loss of the decorated ceramic surface. This presentation describes the treatment of the pyxis, including the role of diffusion to remove salts from the ceramic and the relationship between salinity and conductivity. 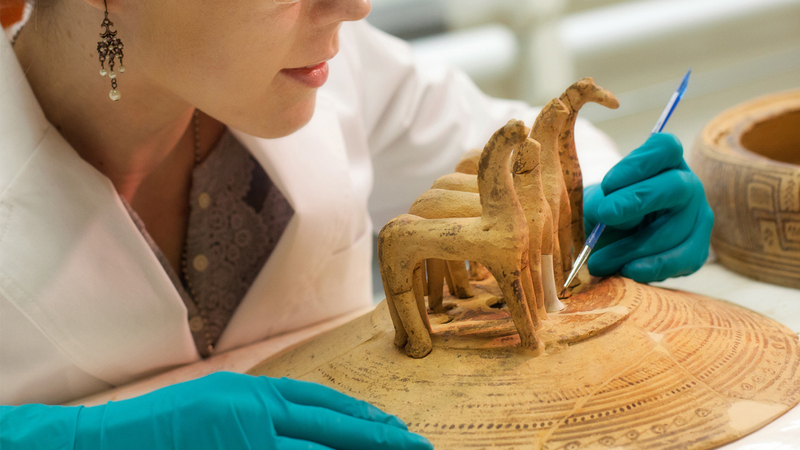 This is part of the Science of Art series that explores concepts taught in Emory's general chemistry classes through case studies featuring objects and conservation projects from the Carlos Museum.